So what does Maserati, Wallis Fashion and Kooba Handbags have to do with one another? ME of course! 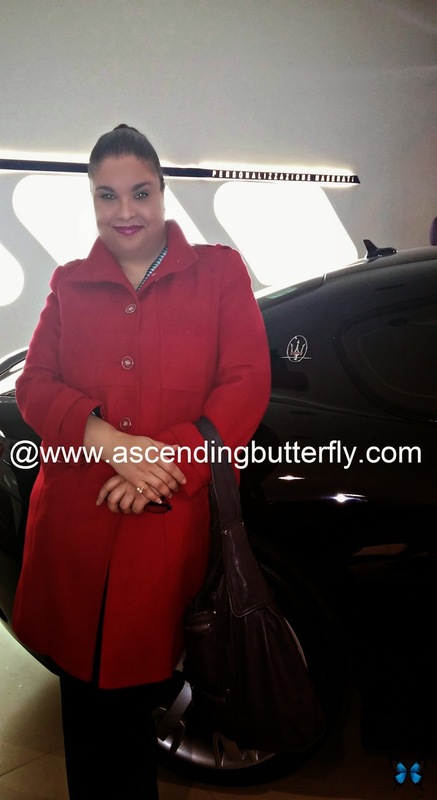 I attended a very smart Fashion Event (which I will share a full recap on very soon) that was held at the Maserati Showroom in New York City, don't you just love the red funnel neck coat by Wallis Fashion I am wearing? I'm carrying a Kooba Handbag. Fashion and Fast Cars? Just another day in New York City my friends, just another day in the city that never sleeps! FTC Disclosure: This is NOT a Sponsored Post. I have not been compensated to share this photo. nice one....not just another day in NY city, I guess....cheers from Indonesia..
@indah - Thanks for visiting from the Wordless Wednesday Linky Hop! No two days in my home city are ever alike, and that's exactly what I love about being a Native New Yorker! @stevebethere - I'm an Aries, and we LOVE all things red! Couldn't leave the handbag behind, I was there for a Fashion event, so I was lugging my Camera and Gear to cover the show! Maserati, Wallis Fashion and Kooba Handbags, Now that's what I call a Trifecta of WOW ! Love that coat,great color !